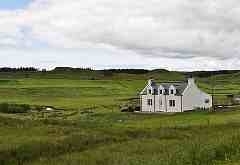 Cottage is situated 4 miles from Portree in an ideal location for touring the Isle of Skye. 3 bedrooms available. Large garden. Free parking.